Original location. Use this option to restore data to the location where the original file resides (or resided): Microsoft Windows server, Linux server, or NMDP server. 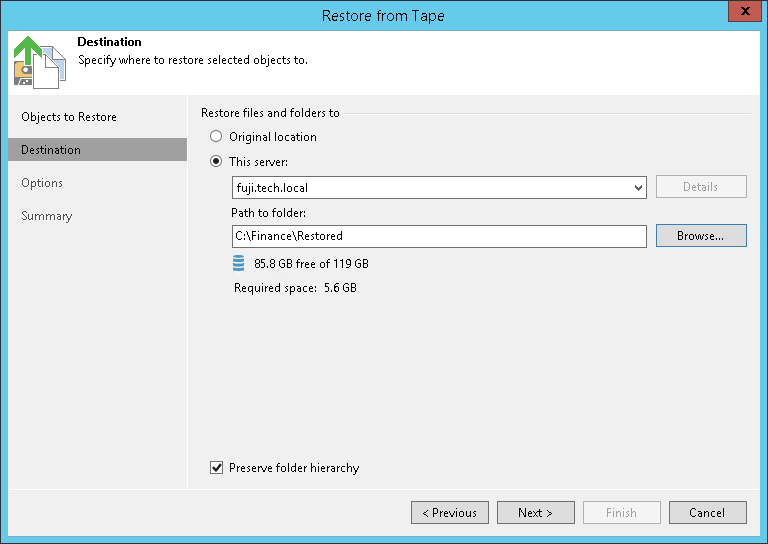 This type of restore is only possible if the original machine is connected to Veeam Backup & Replication and powered on. Microsoft Windows or Linux files: you can restore files to the Veeam backup server, shared folder or to any other machine added to Veeam Backup & Replication. From the server list, choose a machine to which files should be restored and specify path to the target folder. If you choose to restore files to a shared folder, make sure that the account under which Veeam Backup Service runs has write permissions to the target folder. If the account does not have sufficient permissions, Veeam Backup & Replication will prompt you to enter credentials for the account that can be used for writing to the target folder. NDMP volumes: you can restore data to another NDMP server added to Veeam Backup & Replication. From the server list, choose an NDMP server added to Veeam Backup & Replication. In the Path to folder field, specify the volume to which you want to restore the archived volume. When restoring files to a location other than original, Veeam Backup & Replication preserves the folder hierarchy. To restore files to the specified target folder without keeping the folder structure, clear the Preserve folder hierarchy check box. This option is unavailable for restore of NDMP volumes.